and re-building of the present Century/Link/Millennium halls. Below is a transcript of a booklet compiled by Mrs. Stella Adams with information gleaned from many sources especially Mr. Ken Twinning. The booklet was sold for 30pence for fund raising for the new Social Centre. It gives a short history of the birth of the first Village Hall in Shurdington. 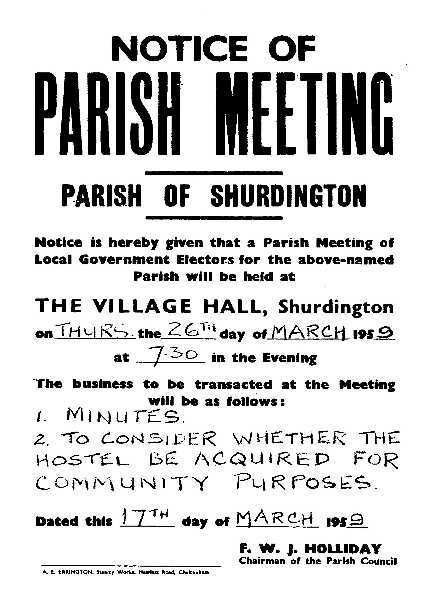 After the first world war the people of Shurdington (then a much smaller population) began to realise that there was no place in the locality where any community activities could take place. An informal committee of well-intentioned persons established itself to discuss ways and means to remedy this situation. A lady of rather strong character, who was a member of that group, became impatient when things did not move forward quickly enough, and took matters into her own hands! In 1925 Miss Rose Herbert Morris (known locally as Miss Byng Morris), received a gift of twenty pounds from a relative. She seized the opportunity to buy the Old Malt House, which was a half-derelict building in Church Lane, situated on the opposite side to the present police station. Other members of the committee felt that this was very high handed, as she had not consulted them about the purchase! Obviously this was a lady who preferred actions rather than words. She was ready to commit her own money when she would demonstrably make no monetary profit. If she were my relative I should be proud to have her as an ancestor. The story has been told that Miss Byng Morris kept two goats. On one occasion she had to go to a funeral in Gloucester. Rather than allow her charges the discomfort of not being milked when they should have been, she took them on the train in the guards van. After the funeral she milked them in the corner of the churchyard before going about her business. The conveyance of the Old Malt House was in her own and two other names, which meant that they could dispose of the premises without prior consultation, and the village would still be without a hall. She levelled the ruined walls, and caused the upper half to be built with white asbestos sheeting. The roof was of corrugated asbestos. Windows and doors were obtained from army surplus from the 1914-1918 war. There was an army surplus depot at Quedgeley. It was several years before a proper floor could be put in. A central heating system was constructed from an old iron stove and large iron pipes were at shoulder level all round the hall. A small stage was constructed at one end and Miss Pat Hitch's mother ran a concert party. There were also other efforts at entertainment and social activities. 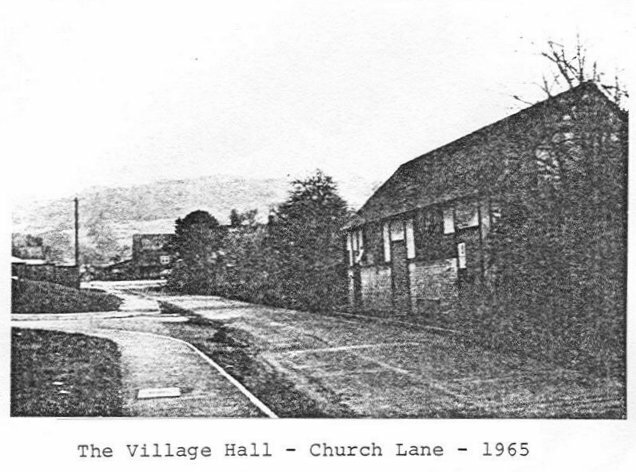 In 1931 and 1932 the village began to extend along the main road towards Cheltenham. In the early 1930s there was evidently some concern over the informal conduct of affairs, and finally there came into being a Voluntary Deed of Trust, dated 5th June 1935, which established a constitution and rules for the management of the Village Hall. Amongst other things, it named the first provisional committee, and set out the procedure for the election of the future management committee. In 1950 a small piece of ground behind and adjacent to the hall was purchased for £48 with a view to extending the hall, but this never came to fruition.. It is interesting to note from this constitution that the management were required 'to pay the trustees, six pounds per annum for repairing the exterior of the . . . . . . premises and insuring the same against fire' . This was built in 1941 or 42 by the War Agricultural Committee, as a hostel for members of the Womens Land Army, and was used initially for this purpose. After this there were Irish agricultural workers, then Italian and later German prisoners of war. By 1951 the Regional Hospital Board acquired the lease and was using it for the rehabilitation of patients discharged from Regional Hospitals for the mentally disabled. These mainly worked in agricultural spheres. Womens Institute minutes show that in November 1959 notice was given that the Social Centre building would be used for all meetings from February 1960, and that the rent for the use of dining hall and kitchen would be twelve shillings and sixpence (approximately sixty new pence). Mr Ken Smith demolished cubicle walls from the old hostel and also built the stage in the wooden section. There were various fund raising activities at that time to pay for repairs, cleaning, and upkeep. 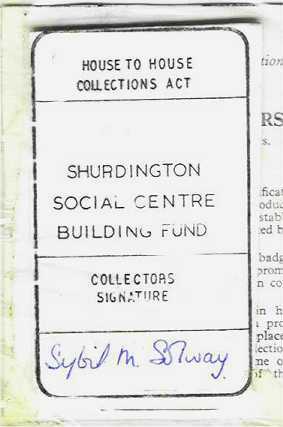 The Trust Deed of Shurdington Social Centre and conveyance of the property from Cheltenham RDC to the trust was signed on October 1st 1964. Some thousands of pounds has been raised over the years in aid of many different charities. For example, jumble sales and coffee mornings for the Star Centre, the British Empire Cancer Campaign, Multiple Schlerosis, the Sue Ryder Hospice, Cancer and Leukaemia in Childhood and so on. June to Dec 1979... ...the reverse. 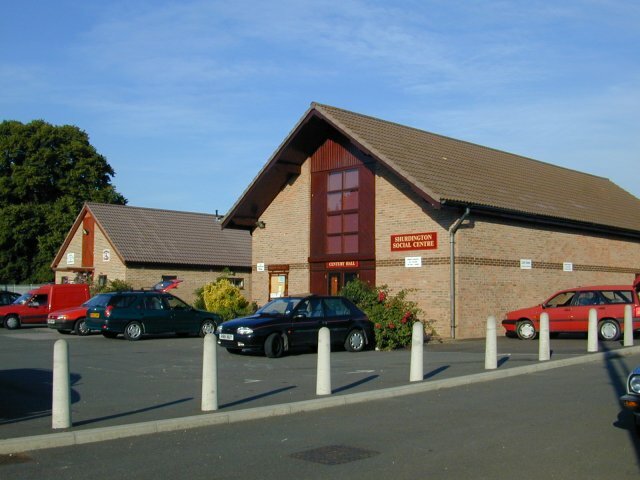 The hall is currently (Ed: as writ in the early 80s) used by Scouts and Guides, the village youth club, the Womens Institute, The Flower Arrangers, the Gardening Society, the welfare clinic and the doctors surgery. During alterations the playgroup have used the school hall - but when this is sold in the near future they will have no alternative venue. The village population has gradually increased and in 1986-1987 was approximately two thousand. In 1979 the then Management Committee decided that something tangible should be done to implement the frequently expressed wish to improve the Social Centre (Ed: the then Agricultural Workers Hostel) and the committee set up the rebuilding fund in May 1979 by the transfer of one hundred pounds from the General Account. 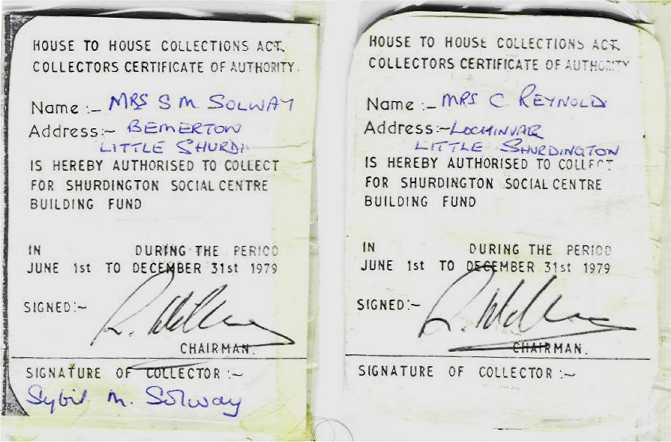 There followed a sustained house to house collection (Ed: see ID Badges above) and organisations and individuals arranged events with much enthusiasm. For a while interest waned, but was eventually rekindled and continues to flourish thanks to the hard work and splendid tenacity of the present fund raising committee, to whom the whole village is grateful. Grants have come in from councils and some grant making Charitable Trusts, which has enabled progress to be made on the new hall. NB. The only costs charged to the fund are for stationery and postage. All work for the fund is entirely voluntary, there being no salaried staff. Copyright © P Calleja-Gera 2001: All rights reserved.